JANE: Last time we ended up talking about cute aliens, which – at least in my taxonomy – leads logically to companion aliens, which are often, although not always, cute. The obvious species for me to mention are the treecats in David Weber’s “Honorverse” novels, since I have written about them in both novellas in the “Honor” timeline and in the “Stephanie Harrington” prequel novels, Fire Season and Treecat Wars. JANE: I was already friends with Weber when the first Honor Harrington novel (On Basilisk Station) was published and I’ll be honest. I really did have doubts about a starship commander and her kitty. As I read, I liked how Weber dealt with the difficulties of taking a “pet” into space. He doesn’t ignore realities like the risk of death from explosive decompression or severe injury in battle. As the novels advance, it become clear that while Nimitz is a hidden asset to Honor in some situations, there are others where he is a vulnerability. So, by the time I was invited to write the Stephanie Harrington novels, I’d moved away from the “girl and her kitty” mindset to the more compelling one of two very different minds meeting. ALAN: Isn’t it odd how many aliens are feline? Tigerishka in Fritz Leiber’s novel The Wanderer (which won a Hugo Award in 1965). C. J. Cheryh’s Hani in her Chanur novels. Larry Niven’s Kzinti… And Cat from Red Dwarf, of course. JANE: Absolutely! It’s something I’d like to discuss later, actually. Going back to the treecats… The thing is, despite the name and how they’re depicted in a lot of the earlier cover art, treecats are not housecats with extra legs and hands. When Stephanie named them, she was only eleven, and following in the long human tradition of naming things not for what they are, but for what they most closely resemble at a quick glance. However, since Stephanie was from Meyerdahl, not Earth, it’s really more likely that she would have been more familiar with cats (which treecats resemble facially) than with either ferrets or weasels. ALAN: I like hexaweasel. I don’t think much of lemur-ferret though. It’s a bit too much of a mouthful. JANE: Treecats are also quite intelligent, are tool users (although on a very basic level), and have some very interesting biological elements that I won’t go into here. The point is, the more you learn about treecats, the more it becomes apparent that in their associations with humans they are truly companions, not pets. I’ll admit, these days I actually prefer writing from the treecat point of view, and have come to see the humans as the companion aliens! ALAN: I’m rather fond of Alan Dean Foster’s novels about Flinx and his minidrag Pip who is a flying empathic snake capable of spitting a corrosive, neurotoxic venom. Minidrags are non-sapient, nevertheless they will often bond strongly with sapients with whom they feel an emotional attachment and Flinx and Pip are extremely close. JANE: You would probably be interested in knowing that Weber realized years after he’d created them, that Pip (and minidrags in general) were an influence on the treecats. I had the pleasure of being present at a World Fantasy Convention where Weber sought out Alan Dean Foster to thank him for the inspiration. He gives Flinx and Pip credit now, and recommends the Pip and Flinx books. ALAN: Good for him! Can I add that I met Alan Dean Foster once when he was a guest at a New Zealand convention and he was a lovely man, very modest, very pleasant to talk with. I’m sure he was thrilled by what Weber had to say. This kind of bonding with vaguely reptilian creatures seems to be relatively common in the genre. I’m thinking here of McCaffrey’s fire lizards and Steven Brust’s jheregs. The fire lizards are aliens, native to the planet Pern. McCaffrey’s dragons were genetically engineered from the original Pernese fire lizards. The fire lizards themselves are about the size of a large bird, and they can have a very intense relationship with the humans to which they bond. JANE: Good point. It’s been years since I read Jhereg. Can you remind me about them? ALAN: The jheregs are also dragon-like creatures one of whom, called Loiosh, bonds closely with Vlad Taltos, the hero of many of Brust’s Dragaera novels. I’m never sure how to define jheregs because I’m never sure exactly what Brust’s novels are. You can argue that they are SF (in which case Loiosh is an alien companion). But it would be equally valid to consider them to be fantasy stories (in which case Loiosh is perhaps best described as a familiar). JANE: The issue of what to call well-realized imaginary world fiction is perennial, isn’t it? I think that’s why when Terri Windling was doing the “Year’s Best Fantasy and Horror” anthology series, she made a point of differentiating. So, let’s see, in addition to catlike and lizard-like alien companions, what else are there? I asked that question aloud as I was typing, and Jim reminded me of my own “Gittchy,” who appeared first in my short story “Winner Takes Trouble” in the anthology Alien Pets in 1998. This was the first of my Captain “Allie” Ah-Lee stories, which I collected in the e-book Star Messenger. I don’t want to say too much about “Gittchy” because what Gittchy can do and where she came from are central to her stories. For those who are interested, the Alien Pets collection did provide a wide variety of “takes” on the idea of alien pets. A couple of the weaker authors did go for the quick humor element, but many took it quite seriously. ALAN: And don’t forget Sand Shadow, the puma in your Artemis novels. You seem quite fond of the idea. Perhaps that’s because there are so many animals in your real life? JANE: Actually, I think fiction made me want companion animals… My parents were adverse to us having pets because they felt four children were enough chaos for any household. They finally broke down when I was ten and let me have a guinea pig. I have had guinea pigs pretty much ever since… We currently have four. See what books can be blamed for? Anime/manga frequently features companion aliens. One of my favorites is the recurring CLAMP character, Mokona. Mokona’s right up there with the Fuzzies on the diabetically cute scale. He looks like a rounded white rabbit with huge eyes and a gem in the middle of his forehead. However, in the second part of Magic Knights Rayearth, the question of just why Mokona is involved with the protagonists and their difficulties becomes very interesting indeed. To me, companion aliens who turn out to be allies in some ways, not just egoboosters or status items (as the firelizards of Pern seemed to become) for their “owners” are definitely the best. ALAN: Yes – the stories always work best when that sense of mutual support is emphasised. But I’ve had another thought about aliens and how we react to them. What are you doing next Thursday? JANE: Talking to you about your thought! I can’t wait! This entry was posted on October 1, 2015 at 1:00 am and is filed under Random Wanderings. You can follow any responses to this entry through the RSS 2.0 feed. You can leave a response, or trackback from your own site. Much as I liked Pip and Flinx, we do have to give a lot more credit than that to Anne McCaffrey and her dragons and especially, her fire lizards. 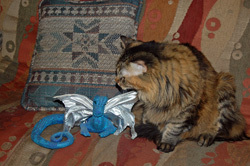 Pip did come along after the first two dragon-rider books were out. Then again, if we wanted to go back in time, the Lone Ranger’s Silver, Lassie, and Sergeant Preston’s dog King are all examples of extraordinary companion animals. I guess 1968 marked the switch from men having horses and dogs to women having reptiles and cats as, well, familiars? There’s actually some Zoroastrian symbolism (or European witchcraft symbolism) going on there, but I’ll leave that for another day. Andre Norton created a number of companion animals in her novels. Murray Leinster had a medical doctor traveling the galaxy with an alien pet named Murgatroyd who is immune to almost everything and who can create medicine to cure most ills when injected with them. My first alien companions were in DC’s “Strange Adventures” comic book, wherein Chris KL99 (created by Edmond Hamilton) was accompanied on his adventures by Halk (from Mars), Jero (a Venusian…this was the ’50s when much fiction still had native civilizations on Mars and Venus) and a chameleon dog named Loopy. I guess Silver and Yukon King were super-intelligent pets, in a way. King was a creation of the sound-effects folks at WXYZ radio where he originated. Richard Simmons, who played Sgt. Preston in the later TV version, once told me that the television King was actually three dogs – the actor dog, the dog leading the sled team, and the dog doing all the running and stunts in the long shots. Three animals amalgamated into one dog – that’s alien! A couple more off-beat ones. There’s Mabob in Janet Kagan’s Mirabile, who’s a cross between a dodo and a parrot and smarter than either of them. Then, if you want to subvert the idea, there’s Aineko the cat in Stross’ Accelerando, although it’s not quite clear who the pet is in that one. And as I forgot to add in the Ariels in CJ Cherryh’s 40,000 in Gehenna, although it turns out that they perhaps have a different use than pet. And if you want to get into Brin and Benford’s Heart of the Comet, there’s a whole other take on alien companions in there. And both books use the term weirders, for some reason. Wonder if there was a deliberate connection? In the opposite direction, I do want to mention Gordon R. Dickson’s short story which makes me very sad whenever I reread it: “By New Hearth Fires,” in which humans become so alien from what we once were, dogs no longer recognize us as the beings who were their companions for so many thousands of years. That’s a future I most definitely do not desire. Some of the interstitial pieces in Simak’s CITY touch on a similar theme as Dickson’s tale. Good thoughts all around… Andre Norton certainly influenced my desire for companions aliens. Perhaps we seek to know what makes us human by figuring out what makes someone else not.